RapidMiner and Keyrus South Africa, a subsidiary of the Keyrus group, have partnered to offer advanced analytics services which provide a seamless channel to embed results in business operations. 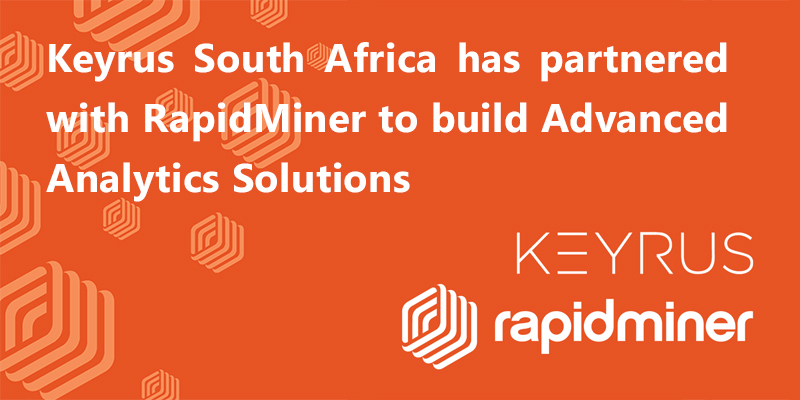 Keyrus South Africa, a subsidiary of the Keyrus Group and a specialist in Data Intelligence, announces the signing of a new partnership with RapidMiner to deliver a powerful and collaborative analytics platform for accelerating the creation, delivery, and maintenance of high-value data science. Gartner predicts that Data science, analytics, machine learning and artificial intelligence are the engines of the future. Advanced Analytics is a top business priority and there is an emphasis to make advanced analysis accessible to more users and broaden the insight into the business. Advanced analytics is the fastest-growing segment of the business intelligence and Analytics software market. Keyrus has partnered with RapidMiner to meet this growing demand and deliver a better return on investment. Keyrus and RapidMiner are able to provide a seamless channel for companies to embeded the results of advanced analytics into their business operations. “To build and execute successful data science projects you need to understand the data, structure the data appropriately and have a wide range of modelling options available. RapidMiner has shown itself to be a one-stop shop for these data mining stages and is all-round consistent. Additionally, there is an incredible array of features that enables effective team collaboration” declares, Michael Okelola, Data Scientist at Keyrus South Africa. “We are delighted to be working with Keyrus South Africa as we continue to grow our family of reseller and systems integration partners. As we ignite the predictive analytics and machine learning markets with the RapidMiner data science platform, we seek out partners with both relevant experience and a desire to drive innovation into the heart of organisations. With their long pedigree and proven track record in the analytics world, we are excited to start working with Keyrus in this region”, comments Fred Gedling, SVP EMEA & APAC Channels at RapidMiner. RapidMiner, the industry’s #1 open source data science platform, is disrupting the industry by empowering all organisations to put data science behind every decision. Their visually-based software accelerates the process of creating predictive analytics models and makes it easy to get the results embedded in business operations. RapidMiner also democratises data science through its expert marketplace by connecting its vast community of expert users with organisations seeking to begin data science projects. For more information, visit www.rapidminer.com. RapidMiner and the RapidMiner logo are trademarks or registered trademarks of RapidMiner Software Inc. and/or its subsidiaries in the United States and/or other countries. All other product and company names and marks mentioned in this document are the property of their respective owners and are mentioned for identification.